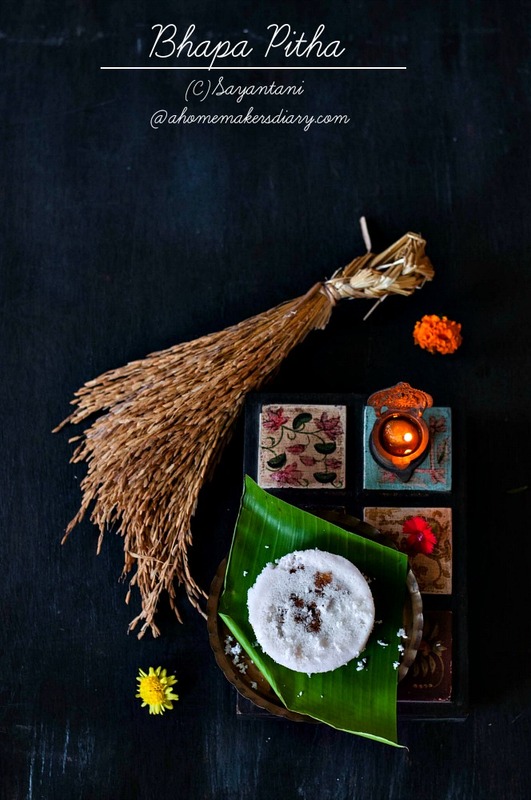 Wish you all a Blessed Poush Sankranti. May the Goddess bless all of us with food and shelter and pray that this coming year no one in this world goes to sleep hungry. Sorry for again being late in bringing you a new Pithe recipe. I love making them but this year my plate is overflowing with work and it definitely is much more than I can chew but just the thought that my work provides for someone keeps me going. It's a responsibility that I cannot say no to at the moment. hopefully in coming times things will improve. As a food lover, Recipe curator, Pithe making is one thing that I enjoy a lot but evrytime I get myself going I wonder at the sheer labour involved in the whole process. I have never seen Maa, Dida (grandmother) or any older ladies of our home flinch an eye while doing this. They would clean, pick, soak, dry, grind the rice all by themselves to make the rice flour that we but readymade from the market. 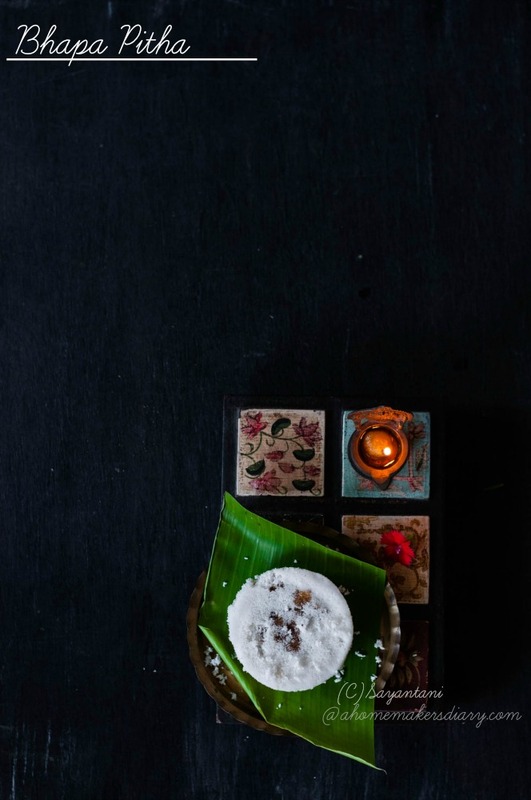 and think of the huge amount in which they used to make these sweetmeats to feed a joint family. Kudos to our traditions and those loving hands for feeding us such amazing food with love and care. This definitely is one tradition that we need to preserve for our coming generation. So here is my recipe for one of the most easiest pithes. 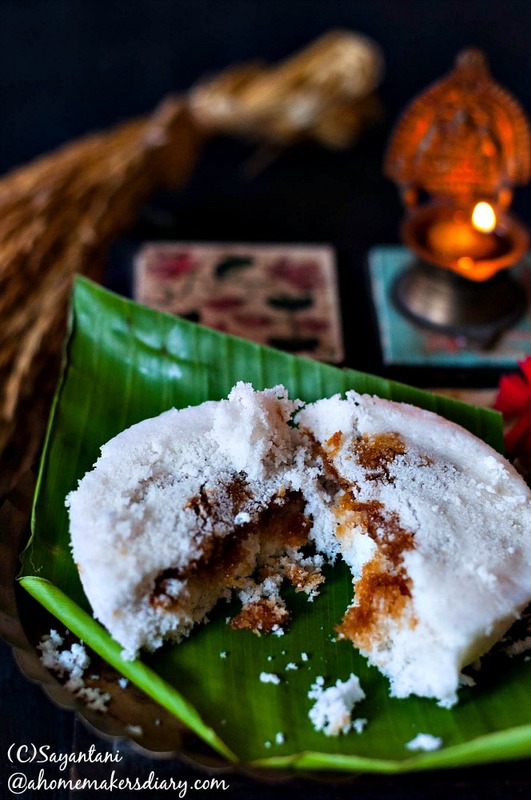 Bhapa pitha is known in different names across communities and region. In Assam this is Ketali pitha/ Tekeli Pitha where it is steamed in the mouth of a ketali/ketli/kettle. Among the Muslims in Birbhum this is Dhupi Pitha or Dhnuki pitha which they steam in matir sora or earthen flat bowls. But it;s almost the same. The process is real simple and quick if you know the process and have the right utensil. 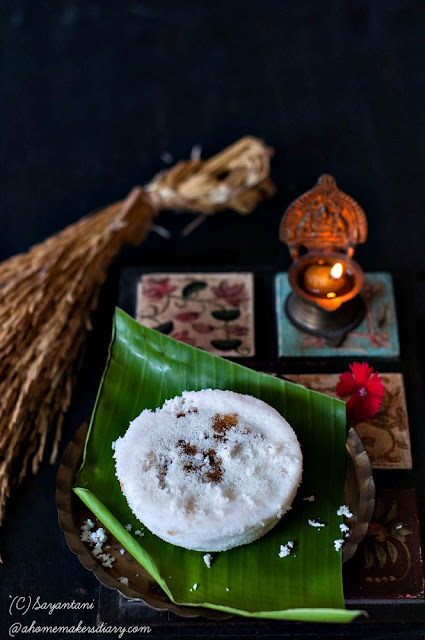 This Pithe is best made if you make the rice flour at home (process below) but store bought powders are good too. For utensils you can either use a steamer/ Rice cooker or use a pan/ Handi with a tight fitting lid. All you need to do is to make a few holes on the lid and that could work as a makeshift steamer. MAke Sure you serve them right away while still steaming hot. As it cools down it starts to harden which you can refresh by steaming again. Take the rice and salt in a big bowl and mix. Add warm water 1 tbsp at a time and mix. The resulting mix should look like bread crumb or wet sand. Keep mixing and rubbing to make the flour moist but not a dough. After adding 1/2 cup and mixing properly take a handful of mixture and press, if the flour mixture comes together in a shape then you are ready to go or keep mixing more water and testing by pressing in your hand. once you are happy with the mixture cover and keep it aside for 45-60 minutes. During this time the flour will absorb the water and if needed you can add more water and mix for a moist pitha. Now sieve the mixture through a mesh sieve. See the adjacent picture for reference. Once you are happy with the mixture bring your steamer to a boil. Take a small bowl and place the rice mixture to cover the bottom and sides of the bowl. Place 1 tsp of coconut in a layer, add 2 tsp of jaggery on top of it and then again 1 tsp of coconut on it. With rice mixture cover the fill the bowl. Do not press it too tightly. Now take a fine clean cotton fabric and cover the top of the bowl. Gather the loose ends of the fabric at the bottom of the bowl and carefully invert it on the steamer. 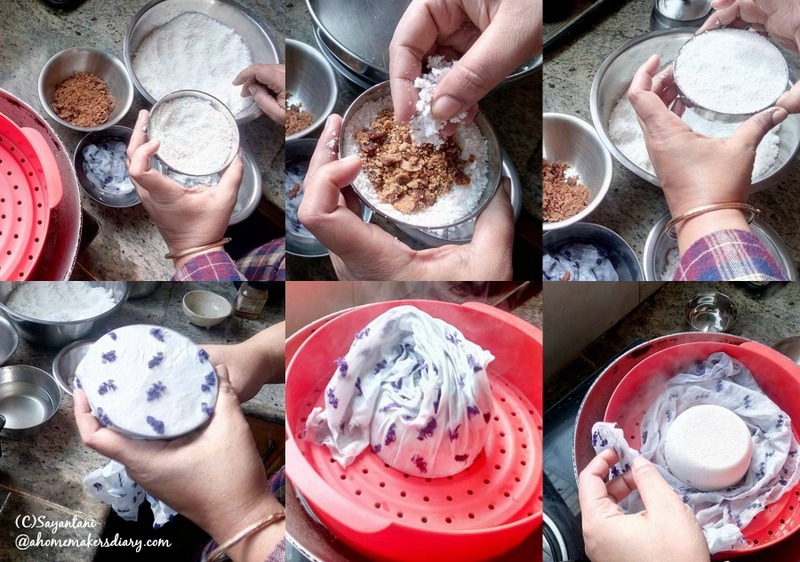 Carefully bring the cloth ends on side and tap the back of the bowl 2-3 times. Take out the bowl and there should be nicely shaped bowl of rice on the piece of cloth. bring the end of the fabric to cover this rice mound. cover the steamer and steam for 5-8 minutes on medium. Using a spatula take it out and serve immediately with more liquid jaggery/ jaggery syrup (boil jaggery and water) and scraped coconut. 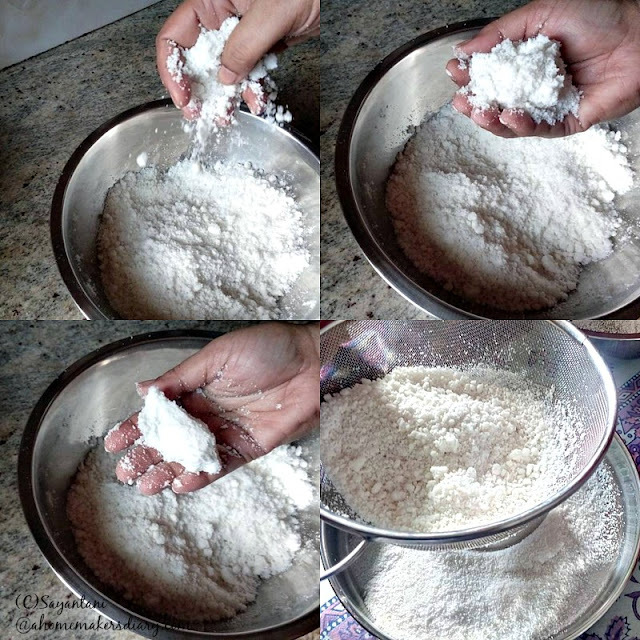 To make rice powder at home. wash and Soak 2 cups atop or sun dried rice for 3-4 hours. 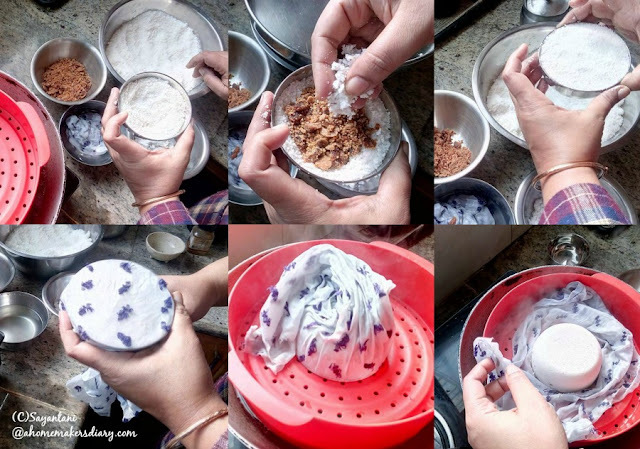 Drain and spread the rice on some clean cotton cloth in a single thin layer. Let it dry for 6-7 hours then grind it in your mixer for a very aromatic rice powder. Amr Bangladeshi friend Ra Dhupi Pitha bole.